This pregnancy is flying by! I think I’ve said that every update so far but I really couldn’t believe it was time to post one again and even contemplated skipping the update since it feels like I just did one. Weight gain: 12-14 pounds. It depends on the day but so far I am right at “average." This is double what I’d gained at this point with Madeline but I had a lot of trouble gaining in the beginning with her, which resulted in growth scans and extra checkups, and then it all packed on (and then some) at the end. I definitely think I look much bigger this go around! Symptoms: I am SO exhausted. Exhausted doesn’t even sound like a strong enough word to describe how tired I feel! They checked my iron levels this week just to be safe but everything is fine - it’s just being pregnant! I had a little bit of round ligament pain starting and have been insatiably hungry. I am also having a hard time getting restful sleep because Madeline was sick for about a week with a cold and I am constantly having to get up to pee. Still a little nauseous every now and then but that has improved so much! Cravings: Red meat recently and still loving fresh fruit, watermelon and citrus fruits, peaches, and flavored water (preferably lime or cucumber). I have indulged in more sweets than usual in the last couple weeks too but haven’t gone crazy - it’s certainly not a craving like it was when I was pregnant with Madeline! Eating lately: I’m still eating 4-5 small meals most days. My favorite meal to cook at home right now is tacos and my favorite meal to eat out is a chicken kabob wrap from my favorite Mediterranean restaurant. It comes wrapped in a pita with Mediterranean slaw, a pickle, and some kind of amazing sauce. Luckily the Chick-fil-A craving has passed! Exercise: I’m working out about five days a week right now. I’m hoping to get it back up to my regular six once Madeline goes back to preschool in a couple weeks but we are in the survival phase of the summer. I’ll be sharing my second trimester workout routine in a couple weeks. Baby’s Movement: Baby boy has been moving a lot! This is so fun for me because I could never feel Madeline move this much because of my placenta placement during my first pregnancy. Corey can already feel him move from the outside which is also so special because he wasn’t able to up until the very, very end with Madeline. Wearing lately: I am wearing maternity shorts, these non-maternity but bump friendly shorts, these non-maternity swing tanks, these maternity tees, and finally made the switch to maternity leggings for working out. Sleep: I am not sleeping well at all. I am just having a hard time settling my mind. I have had a lot of anxiety since my car accident last year and it has been really high especially lately as it is finally time to settle the claim. Just lots of unpleasant memories dug back up at a time when I am clearly much more tired and emotional than usual! Coupled with having to get up to go to the restroom multiple times a night and checking on Madeline when she wasn’t feeling well, I am just worn out! Stretch Marks: None yet. I’ve been alternating this oil and this one that I shared last time and then using this belly butter. I apply twice a day. Belly button in/out: Its in! Highs/lows: The highs from the last month have been organizing baby clothes by size and working in the nursery. We have lots of cute hand me downs and a few pieces that I’ve picked up but I think it’s safe to say this little boy will be well dressed, at least through his first birthday! I have been busy working on the nursery too and have made a lot of progress. Most of the big things are purchased or ordered and decor projects are pretty much complete aside from things being hung on the wall. I even ordered the glider! I know I will be struck with other projects once the queen bed is out of the room and the crib is in but we are in pretty good shape and I feel good to have a few tasks off my plate. Next up is Madeline’s big girl room. For the month my lows are just being exhausted and more anxious than normal. I could really use a big glass of red wine before bed right now! Haha! 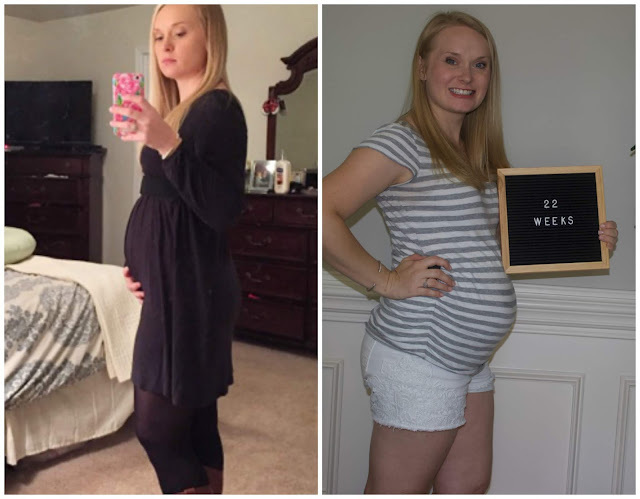 Here’s a side by side of me at (almost) 22 weeks with Madeline and 22 weeks with Baby Boy! I'm definitely larger this time, which I hear is common with second babies. 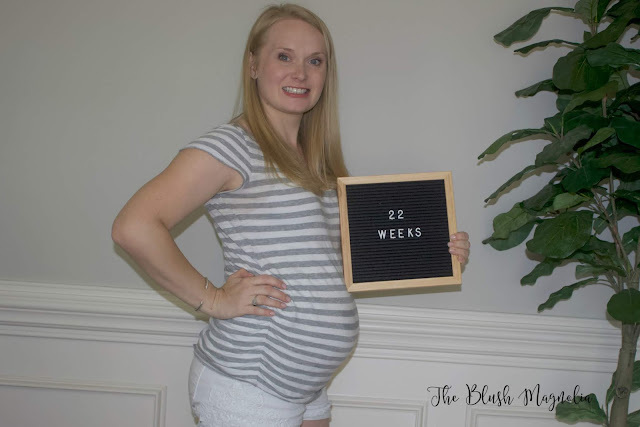 You can read my bumpdate from my first pregnancy here.